About two and a half years ago, I was having coffee with a friend at Harbord, a suburb in Sydney. In passing, she happened to mention a large rock that just appeared out of nowhere one day amongst the other rocks. Apparently it was found when a couple who walked that area daily discovered it. Since they knew the area very well, they were sure it was not there the day before. Reported by the local newspaper, its mysterious appearance and speculation of how it came to be there caused quite a stir! I expressed my interest in seeing this rock and once our caffeine intake had been satiated, we ambled our way to where she thought it was. It was unmistakably different compared to the surrounding ones. The ‘new’ rock was quite large – about 12 feet in length by 5 feet in width at the widest point and we estimated at least a tonne in weight. Upon the top of the rock was this magnificent crystallised surface. It was placed, as if it had just been put there very neatly, on a couple of other rocks. The shape of the rock was unusual also – triangular — with edges that I likened to that of a jellyfish; quite sharp, not like the other rocks which have been there for hundreds of years and have become well-rounded by action of the sea and the winds. There were also barnacles hanging from its undercarriage, something missing from the underside of the surrounding rocks. For some reason, I felt some reverence for this rock, and did not step on it that day, but just observed its beauty. A few months ago I woke up with this desire to see the rock again, and this time to dowse it. I had not thought of the rock before this and found a strange pull towards it. So I set off with my pendulum and rods to see what it would tell me. It was a beautiful day and the sea was relatively calm. I went through my usual procedures “Can I, May I, Should I” and asked permission to step onto the rock. By this stage the crystallised surface had disappeared and there were ridges on the surface. The answer was that the energy radiated from the centre of the rock, with eight concentric circles emanating from it. As I continued to ask questions of the rock, an interesting story unfolded. Walking from one edge to the other, I found that there were also eight parallel lines across the rock. The rock was dowsed to have healing powers, with the strongest source of energy coming from the centre. My curiosity of how it came to be there was answered with that it came from an extra-terrestrial source. With further dowsing, the rock told me that it’s appearance was not helped by human sources or Mother Nature. This intrigued me, prompting me to explore further. There was a definite Earth/Universe connection with the rock. I asked if there was a ley line passing through this rock and the answer was ‘yes’. However, when I compared the incoming flow to the outgoing flow of energy, the rock for some reason was deflecting the line. The incoming ley line was from an east-north-easterly direction, and once it reached the rock, was deflected sharply to a west nor-westerly direction. This confused me initially, and I dowsed that the ley line had originally continued straight on before the rock’s appearance. Since the arrival of the rock however, the ley line was now being deflected by it onto a new path. This dowsed as one of the reasons for the rocks sudden appearance. The answer she received was ‘yes’. I don’t know what this may mean, but my friend and I were able to discern from our questions that this rock was there for a higher purpose. Later I map dowsed the direction, and the places that the ley line was coming from and going to. 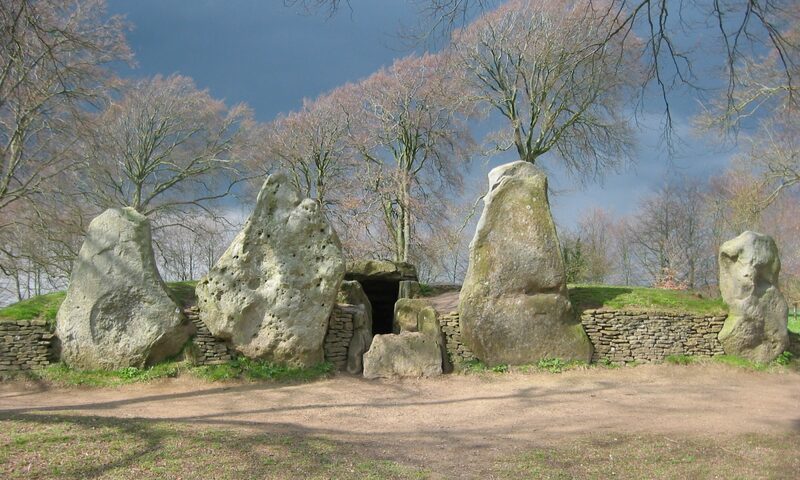 My findings did not surprise me, as whilst I was dowsing the rock, my intuition of these places came through. Starting in Ireland, the line seemed only to stop at a place between La Paz and Todos Santos in Bolivia (Ed: a node point? ), and Easter Island before crossing Australia’s eastern seaboard near Harbord, Sydney. Once the ley line reaches Harbord, it then deviates in a westward direction. The next ‘stopping’ point was map dowsed to be just north of St Mary’s Peak in the Flinders Ranges, South Australia before travelling, seemingly without stops, to Ireland once more. What to make of this I know not yet. But I look forward to further investigation regarding the rock and its meaning……and any feedback is of course welcome.